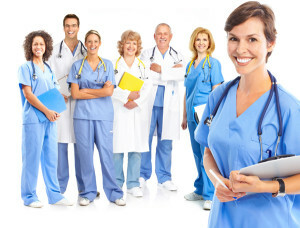 Nursing is an essential part of the medical field and many individuals how to become a registered nurse. Those who have a desire to make a difference in the healthcare field providing care to a wide range of patients should consider the nursing field. Nursing is not for the faint of heart and good nurses display compassion, empathy, and an excellent code of ethics. Nursing degrees are offered at all educational levels: associate, bachelor’s, master’s, and doctorate. An associate degree in nursing is typically the minimum education needed to become a registered nurse, and it focuses on the technical abilities of the nursing field. A bachelor’s degree in nursing emphasizes both the technical skills as well as nursing theory. It requires general education requirements and nursing education core courses. A master’s degree in nursing provides students with advanced education in nursing and enables nurses to specialize in a specific area. A doctorate degree in nursing is the highest degree level and the programs prepare individuals for upper-level careers in nursing research and academia. The job outlook for registered nurses is excellent, with an anticipated employment growth of 26 percent by the year 2020. In general, individuals who are interested in becoming a registered nurse must complete certification in CPR and courses in anatomy and physiology, chemistry, and biology. Some programs also require courses in English, psychology, and nutrition. The timeframe to get an associate degree to work as an RN is about two years. Bachelor’s degrees in nursing take about four years, master’s degrees two years after a bachelor’s degree, and doctorate degrees four to six years after an undergraduate degree. To gain acceptance into a master’s or doctorate degree in nursing, students commonly need an undergraduate degree in nursing as well as a current nursing license. After completion of a registered nursing program, individuals must take the National Council Licensure Examination for RNs. When choosing a RN degree program, students should make sure that the college or university offering the program is accredited to ensure they receive a high quality education. The ranking of an institution is also beneficial, and many publications grant rankings to schools based on various characteristics. Other aspects to consider include location of school, class size, nursing specialties, clinical rotations, and cost. Examples of top rated RN degree programs include Johns Hopkins University and Western Governors University. John Hopkins University strives to meet the needs of a diverse group of students and it offers bachelor’s, master’s, and doctoral nursing programs. Western Governors University offers a bachelor’s degree in nursing online that enables RNs to gain a broader understanding in the nursing field. After completing a nursing degree and obtaining a RN license, there is a large range of career opportunities. RNs can choose to work with children and babies as pediatric nurses. Some may choose to take on an administrative role, such as a nursing case manager. Others may go into the education field as health care educators. And many RNs pursue nursing positions in other fields, like forensic nurses and nurse writers. Graduates of advanced degrees can also pursue advanced nursing practice positions, such as nurse practitioners or nurse researchers. The nursing salaries vary greatly by education, experience, employer, and location. In general, pediatric nurses earn an average of $74,000 per year. Nursing case managers may around $63,000 annually. Health educators earn about $65,000 yearly. Forensic nurses make an average of $60,000 annually and nurse writers around $50,000. Nurse practitioners earn annual wages around $100,000 and nurse researcher make about $93,000.